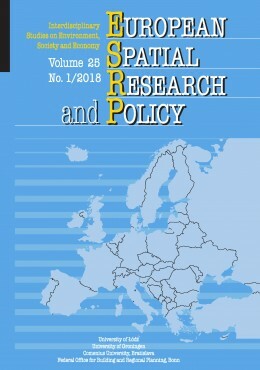 European Spatial Research and Policy is a review concerned with the problems of social and economic organisation of space at local, regional and supranational levels. Comprising both theoretical and empirical aspects of spatial analyses, the journal is aimed at academics, policy-makers and practitioners interested in a broad range of spatial developments in contemporary Europe. Its main areas of interest include, among others, regional policy, spatial planning, European integration processes, labour market developments, foreign investments, and environmental problems. Contributions prepared by geographers and regional scientists, as well as economists, architects, sociologists and historians who undertake spatial research within their respective disciplines reflect the interdisciplinary character of the review. European Spatial Research and Policy jest czasopismem naukowym, zajmującym się problemem organizacji przestrzeni na poziomie lokalnym, regionalnym i ponadnarodowym w aspektach: socjalnym i ekonomicznym. Stanowi ono międzynarodowe forum wymiany myśli i doświadczeń. Czasopismo jest skierowane zarówno do środowiska naukowego jak i praktyków oraz decydentów politycznych. Główne obszary zainteresowania to: polityka regionalna, planowanie przestrzenne, proces integracji europejskiej, wskaźniki zatrudnienia, inwestycje zagraniczne, zanieczyszczenie środowiska, globalizacja i inne. Artykuły są pisane przez przedstawicieli różnych środowisk naukowych, min. : ekonomistów, architektów, socjologów, historyków, stąd interdyscyplinarny charakter periodyku. Contributions submitted for publication should be prepared in good quality English. Articles must be restricted to 5,000 words and should not exceed 25 standard pages including illustrations, tables and references. Notes, commentaries and reports should not exceed 2,500 words. Manuscripts submitted to the journal must not be under simultaneous consideration by any other journal and should not have been published elsewhere in a substantially similar form. Manuscripts, preferably written using Microsoft Word, should be sent via e-mail to: esrap-me@geo.uni.lodz.pl. The title, author’s name, affiliation and a short biographical sketch of not more than 50 words should be submitted on a separate cover page. The title of the article should appear again on the first text page, without the author’s name. Authors should supply on a separate page an abstract of not more than 100 words to appear at the beginning of the article. Tables and illustrations should be titled and numbered. Each should be placed on a separate sheet at the end of the text. All line diagrams are termed ‘Figures’ and should be referred to as such in the typescript. Maps and graphs should be prepared in such a form that they can be reproduced without redrawing. Tables should be submitted in a camera-ready form. The places where tables and figures should be inserted in the text must be clearly indicated. for articles in a book – name(s) of author(s), year of publication, title of the article, name(s) of author(s) or editor(s) of the book, place of publication, publisher. Explanatory footnotes in the text should be numbered consecutively throughout the paper and be included on a separate sheet at the end of the text. Any acknowledgements should appear at the end of the text. Note: All submitted articles undergo a process of blind peer review. Books for review can be addressed to the Editors. All scientific articles undergo a process of double blind peer review (authors and reviewers do not know their identities). Contributions are reviewed by at least two independent reviewers from outside the unit (department) to which the author of the article is affiliated (at least one reviewer should be affiliated to a foreign institution). The review is prepared in written form and is concluded by a clear conclusion whether the article may be published in the journal or should be rejected. The review form is published on the journal website. Authors should reveal their share in the contribution (with their affiliation), indicating author of the concept, thesis, methods etc. The person submitting the article for publication is responsible for delivering this information. Contributions submitted for publication will be checked for ghostwriting and guest authorship (the relevant information on scientific unreliability will go to the institutions employing the authors, scientific societies, etc.). Authors should inform the editors about the sources of financing their publication and contribution of research and development institutions, societies and other entities. All cases of scientific unreliability, violating and breaking the rules of scientific ethics, will be exposed by the editors. to review the research reported in a manuscript or knows that its timely review will be impossible should immediately notify the editor so that alternative reviewers can be contacted.